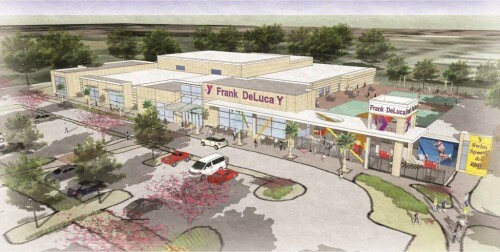 To commemorate a $1 million dollar gift from Ocala business and community leader Frank DeLuca, the Marion County Y and the Central Florida Y association’s leadership have offered to name the local Y the Frank DeLuca YMCA Family Center. And DeLuca has accepted the honor. The surprise announcement was made at a March 19 reception amongst Y supporters and friends of DeLuca. DeLuca’s gift will be applied toward a $4.5 million capital campaign to renovate the existing center located in Ocala. On track to serve nearly 35,000 adults and children each year during the next three years, the proposed capital improvements are essential to ensure the Y can sustain its quality of it programs offered at the family center and within the community. The Y is committed to nurturing the potential of kids, promoting healthy living and fostering a sense of social responsibility. The Marion County Y, now the DeLuca Y, currently reaches 20,000 people in Marion County and serves 8,000 kids. Marion County’s Y was also recently determined to be one of the top five YMCA’s in the country based on surveys of almost 1,100 YMCAs conducted by SEER Analytics consulting firm. The Marion County YMCA improves lives and is a place where the whole family can enjoy activities in a wholesome and fun atmosphere.